I really struggled with the results of Tuesday's election. I'm in shock, actually. Robert de Niro says he feels as he did after 9/11, and so do I. On Wednesday, I didn't know what to do. I simply gave the class I planned to give. I couldn't think about it. In fact, I didn't even think about the DA I'd planned to go to. I understand even Mulgrew was unable to go through with his usual filibuster and actually allowed people to express themselves. In my car, going home, I cried. How can my country make a choice like this one? How can we spit in the faces of the children I serve? How can we tell working people they can just go to hell? How can we elect a repulsive purveyor of snake oil to the highest office in the land? Shaun King posted the graphic at left on Twitter. He said it came from a Chicago school somewhere. I fell in love with it. Some time on Wednesday, I asked that my school reproduce it so I could hang it my classroom. That request was denied on the basis that it was too direct a repudiation of President-elect Donald Trump. On Thursday, I put it on a flash drive and displayed it on the LED screen in front of my room. I read it to my students. 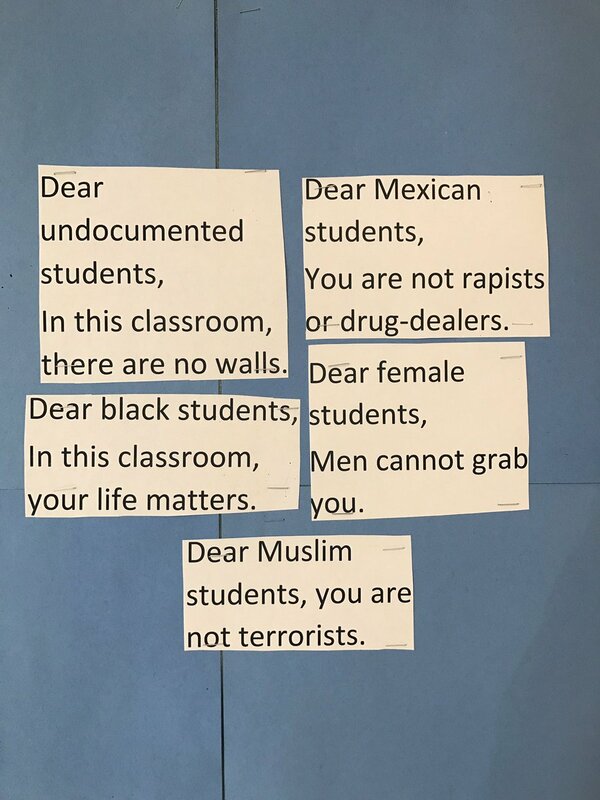 I told them no one in my classroom was a threat to them. I told them they were in a safe place. I read each of the little notes and told them no one would contradict anything they said. 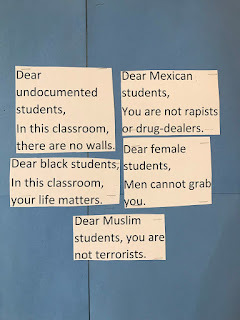 I never mentioned Donald Trump, but my students did, repeatedly, and they knew exactly why I was saying this. Chancellor Fariña declared there would be no overt political talk in class. To a degree, I understand that. It's not my place to tell kids who I voted for. It's not my place to tell them who to vote for either. I would never do such a thing. But I knew they would ask me anyway. Nonetheless, on Monday, I wore a tie a little bit like the one on the right. You wouldn't notice what was on it unless you looked closely. 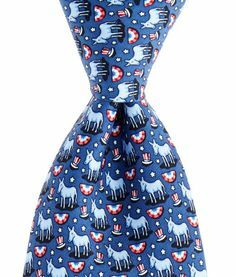 When the kids asked me who I was voting for, I showed them the tie. I told them that a donkey represented Democrats, and an elephant represented Republicans. They didn't know that. They looked at my tie and said, "Oh, you're voting for Hillary." I was glad they asked, because I needed them to know I would not vote for someone who hated them and everything they stood for, to wit, the American dream. I also needed them to know that I stood against all the bigoted and xenophobic statements our President-elect made. I'm sorry, Chancellor Fariña, but I'm a teacher, and unlike Donald Trump, I stand for basic decency. My classroom rule, really my only one, is, "We will treat one another with respect." Donald Trump failed to treat a wide swath of people with respect. He's a hateful, vicious bully. There are all sorts of anti-bullying campaigns that go in in city schools, and I fail to see why Donald Trump should get a pass simply for having lied his way to the Presidency. So I specifically repudiated a whole group of his insidious statements. I also added LGBT to my group, and told my kids that we would not tolerate slurs to gay people in my classroom. Even my kids seem to expect a pass on that. They won't get one. For tonight, I've asked that the UFT Executive Board either make a poster like the one above left, or give me the means to project it from my flash drive. I'm going to ask that UFT do a campaign of tolerance that specifically rejects the vicious and disgusting statements of our President-elect. I'm going to ask that UFT campaign for respect for all, specifically in response to Trump's bigoted and hateful appeals otherwise. And Chancellor, Fariña, if you don't like what I did in my classroom, I invite you to place a letter in my file. It will be a virtual badge of honor. I'll frame it and treasure it always.